Childhood is a gallery of firsts...firsts experiences, first friendships, first challenges, first hopes, first dream, first surprises, and first success. The Mercer County ESC will be accepting Preschool applications for the 2019-20 school year starting January 2, 2019 at 7:30 a.m. Due to the limited amount of openings per class, spots will be filled in the order that applications are received. If you have any questions about the application process, please contact Janice Diller at 419-586-6628 ext. 221. To download and print off the 2019-20 Preschool application, click HERE. * We will not accept any applications received before January 2, 2019. If you are concerned about your child's progress, he/she may be screened during our fall and spring Child Find or call the Mercer County Educational Service Center at 419-586-6628 and speak to Janice Diller, Preschool Secretary. Services are free to residents of Mercer County school districts: Celina City Schools, Coldwater Exempted Village Schools, Fort Recovery Local Schools, Marion Local Schools, Parkway Local Schools and St. Henry Consolidated Local Schools. Preschool Itinerant Services. 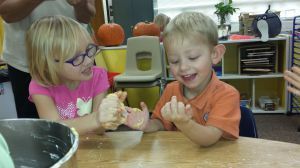 These services are provided by preschool special education teachers in two different methods of service: 1) Services delivered in the home environment. 2) Services delivered to a child attending a public or private preschool. Center-based Services. These services are classroom programs that provide group educational experiences to children led by preschool special education teachers. Related Services. These services are available to children who qualify in one of the following areas: communication, hearing, vision, social-emotional/behavioral functioning, motor functioning, adaptive behavior, cognitive ability. Encourages curiosity, initiative, persistence, and self confidence- all attitudes which lead to life-long learning. Helps children develop thinking and problem- solving skills. Expand the knowledge of self, others, and the physical and social world. Enhances the development of the whole child, including his learning, communication, physical, and social skills. Enables children to see adults as respectful, nurturing, supportive, responsible, and helping resources. Child Behavior Tip: When your child activates a behavior, that behavior has no meaning until you give it one. For instance, if a child spills milk at the dinner table you could see spilled milk as terrible, an inconvenience, as ruining the carpet, or as lack of attention by your child. You could also see spilled milk as a clue that your child lacks pouring skills, needs opportunities to practice, as the perfect time to teach about the importance of cleanup,or as a time to demonstrate cooperation and the beauty of a family pulling together to deal with a mini-crises. All your child did was spill milk. You decided what it meant.